March 2007 ~ I Can Do That! I wrote about longaniza last year but haven't made them since, until today. I was going to serve them as longaniza burgers but everybody prefers garlic fried rice with vinegar chili dip, Pinoy kasi. I made some thick patties and the rest I stuffed in hog casings. 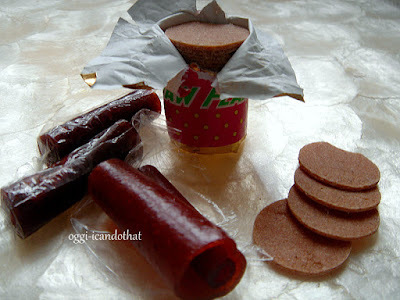 I love longaniza with everything: rice, pandesal, pancakes, waffles, I should try them next with thick fries. Mix pork with salt and sugar. Grind using large die. Transfer into a standing mixer bowl with paddle attached. Add the rest of the ingredients except casing. Mix on low speed for 2 minutes. Form into patties or stuff into hog casings. Refrigerate for 5 days before storing in the freezer. This Spanish recipe is adapted from my cookbook The Food of Spain and Portugal by Elisabeth Lambert Ortiz. The chicken stew has very few ingredients but very tasty. 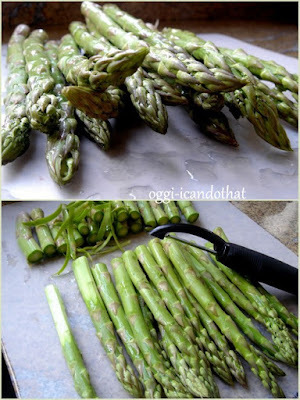 I love its vibrant color on the plate with the steamed asparagus and fresh fava beans. Season the chicken with salt and pepper. In a large frying pan, heat the oil and saute the chicken pieces until golden brown on both sides. Transfer to a casserole or large pan. Add the onion to the frying pan and cook until soft then add the garlic, saute for 2 more minutes. Add the peppers and ham and continue to cook until the peppers are soft. Add the tomatoes until everything is well blended. Add the mixture to the casserole with ¼ C water, season with salt and pepper and cook over low heat for 30 minutes. The sauce should be quite thick. Have lots of dinner rolls or french bread to soak up the wonderful sauce. Variation: If you prefer the dish hot, you can add a small hot red chili, chopped, to the sauce. You can also add sliced green or black olives during the last few minutes of cooking. I have some homemade mayonnaise that I served with the steamed asparagus, a teaspoon is enough to flavor the vegetables. Hollandaise sauce also goes well with the asparagus. Sweet mochi is one of our favorite snacks/desserts specially ice cream mochi and the ones filled with sweet azuki bean paste. I have tried making them once before, about 4 years ago, but was unsuccesful. Thankfully, several good recipes have been popping up online using mochiko (glutinous rice flour) and canned Japanese sweet azuki beans, which are readily available from Asian stores. Tip: Buy only the Japanese beans. I do not recommend the Korean or Chinese, both are too watery and you will have to cook it further until it has the right consistency, it's a waste of time, in my opinion. Transfer beans into a bowl, stir until smooth, store in freezer for 30 minutes while preparing mochi. In a medium bowl mix together rice, water and sugar. Microwave on high for 30 seconds, stir thoroughly, microwave again and stir, 4 more times until smooth and gluey. Cover with a damp towel to keep it warm while shaping/filling. Have the bowl of toasted flour near your work area. Sprinkle the work surface liberally with toasted rice, dip hands on bowl. Scoop a golf ball size of cooked mochi and drop on the toasted rice, form into a round shape, flatten to about 3 inches, fill with a tsp of sweet beans. Gather edges to cover beans, all the while pinching and form into a ball. Place on a container seam side down. Refrigerate leftovers. Mache is the Filipino/Chinese cousin of mochi, they have a common ingredient, sweet rice flour, and both of them are filled with sweet stuff. The difference is the filling, mache has sugar and toasted sesame seeds. This is the first time I made mache, I have no idea how to cook them, I just guessed and steamed them. They turned out sooo good. I will use toasted black sesame and boil them (like palitaw) next time I make them. In a small bowl mix water gradually into the rice, adding more water if necessary until it has the consistency of galapong. Mix the sugar and sesame seeds in another bowl. Scoop out 1 ½ T of rice mixture, form into a ball, flatten, raise edges and put 1 tsp sugar & sesame seeds in the middle. Pinch edges together and form into an oval. Steam on a parchment-lined bamboo steamer for 10 minutes. 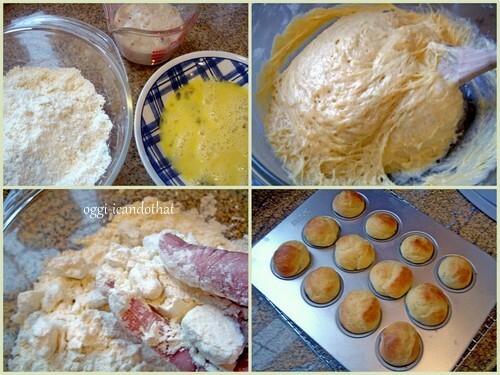 Roll in toasted rice powder. Last week I read in the newspaper a very pretty lobster sandwich in a bun. What made it interesting for me is the layer of potato crisps. I made my version of the sandwich with chicken adobo flakes on sliced bread. The potato crisps add texture and wonderful flavor to the already very tasty chicken adobo. What can I say, it's super crunchy, yummy, and...excuse me but I have to go and eat one more. Yay, carbs! To make: Spread a thin layer of mayo on toasted bread, layer salad greens, sliced tomatoes, adobo flakes and plenty of potato crisps. This Singaporean mee-sua is similar to the misua soup with patola I made 2 weeks ago, it is also served with boiled eggs but the similarities end there. This soup is spicy and has lots of flavoring like prawns and fishballs. I also love it. I bought Japanese or Korean (?) pre-cooked fish balls and sticks because these are very tasty and have the "rubbery" consistency that I love. Also, I don't have the patience to make fish balls. In a large pot, heat the oil, add garlic and nuts, fry until fragrant, then add chilis, stir fry for 1 minute. Add broth and fish extract, let boil for 3 minutes. Add fish balls, prawns and loofah, boil for 2 minutes until prawns are cooked. Put in misua and let boil for 1 minute. Sprinkle each serving with sliced chili and green onions, and egg slices. Mix apples, celery and mayonnaise. Sprinkle with walnuts. Serve with chicken slices. I had the nuggets with honey-mustard-mayo sauce. Also, I want to share this with my Filipino readers who like kiamoy. About a month ago, I read from one of the blogs I visit often, apple slices sprinkled with plum powder which she had in Malaysia on her recent trip. She told me to grate kiamoy over the sliced apples if I'm not able to find plum powder. I can't explain it, but the combination of super salty & sweet kiamoy and sweet & tart crunchy apple is just excellent, I love it! The apple slices have to be eaten immediately because the color and salty flavor become more intense after several minutes, or you can sprinkle the grated kiamoy right before eating. I think the Montelimar mentioned here is a town in France known for its nougat. I found Savoy truffle recipe but I'm not really sure if this is the one George wrote about, it looks more like the coconut fudge. (I tried to link the site but was not able to). Anyway, I made one recipe today, it's very easy to make. I like the subtle brandy taste although dried coconut is not one of my favorite things. In a small saucepan, over very low heat, melt butter and whisk in the egg yolk until thick, add sugar and whisk until smooth. Add brandy and vanilla extract. Add the chocolate chips and stir with a rubber spatula until chips are completely melted and mixture is smooth and no longer glossy. Transfer to a glass container and cool in the fridge for 30 minutes. Shape into 1-inch balls, roll in coconut. Refrigerate leftovers. I have written earlier that I regularly prepare Chinese style dishes, at least the ones I ate growing up and continue to eat as an adult, usually in restaurants, not at home. One dish I will never get tired of is boiled chicken with a dipping sauce of finely chopped fresh ginger, scallions, sea salt and sesame seed oil. Put chicken in a large pot, add 2 bunches washed and halved green onions, 2 tablespoons sliced ginger, and 1 tablespoon sea salt salt. Add water to cover, let boil rapidly, turn heat to medium, boil for 1 hour, turning once. 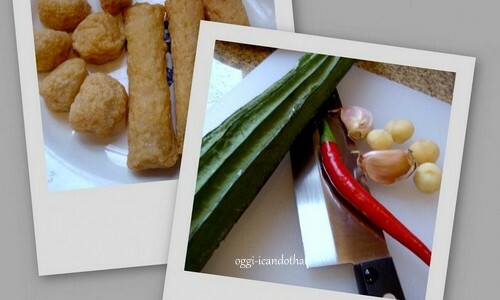 Prepare the dipping sauce: Finely grate ginger to measure 3 tablespoons, thinly slice green onions. Mix together with 2 teaspoons sea salt and 2 tablespoons sesame seed oil. I did not prepare dessert because there won't be any space in the fridge for leftovers. 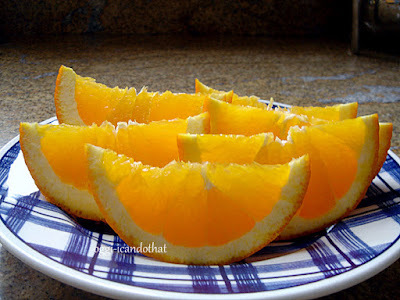 I just served orange smiles (sliced oranges). I'm sure most Filipinos have eaten haw flakes. I used to buy the really big ones and sometimes they also came in squares. The only size available here in the US is the tiny quarter dollar size. They are also now being sold in fruit roll up form, they are soft and leathery and a little bit tart. I love baba au rhum, these open-textured breads/cakes moistened with rum syrup. They are easy to make, there's no need to bring out the food processor or stand mixer as there is no kneading involved, and rising time is fairly short. I like them with fresh figs but they are not in season, preserved fruits are okay. These should be baked in baba molds called dariole molds which are thin, long and tapered at the bottom but they are $32 for 6 pieces, very expensive in my opinion. For one recipe I would need 10 - 12 molds which will cost me $64 and if I want non-stick that's $35 for 4 pieces or $105 for 12, that's just crazy! I used my mini cheesecake pan which are fatter and squat and unfortunately not non-stick and the cakes got stuck and some got broken, no problem really, I just put them back together after dipping them in the syrup. 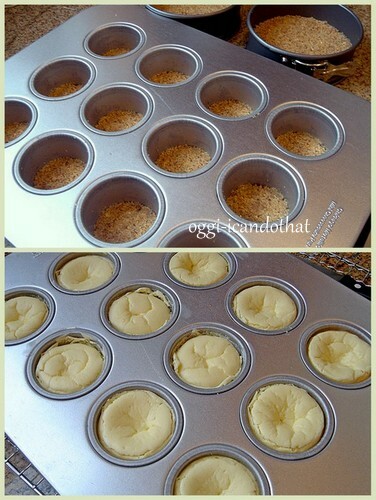 I will line the sides of the molds with parchment paper next time or will use mini muffin molds instead. Brush molds lightly with oil. Place 1 T of the flour, yeast, sugar, salt and milk in a small bowl. Leave, covered until foamy, for 10 minutes. Using your fingertips rub the butter into the remaining flour in a large bowl, until the mixture has a fine crumbly texture.Add the yeast mixture and eggs to the flour mixture. Beat with wooden spoon for 2 minutes until smooth and glossy. Scrape the mixture down, cover and let rise for 1 hour.Preheat oven to 400°F. With a wooden spoon, beat the mixture again for 2 minutes. Divide among the prepared pan. Cover with plastic wrap and leave for 20 minutes until well risen. Bake for 20 minutes until golden brown. Prepare the rum syrup: In a medium saucepan, combine the water and sugar and let boil for 10 minutes. Let cool slightly then add rum. Dip the still warm babas until completely saturated. Keep leftovers in a covered container in the fridge. Strain leftover syrup and refrigerate. Drizzle some of the syrup on the plate and on top of the babas. I love the babas swimming in rum syrup. I don't like salmon, it is so stinky and the fishy smell persists in the house for days. I have grilled it, poached it and made it into sausages before, nothing seems to reduce the fishy taste and the smell, oh the smell! But I have to serve it once in a while for the good stuff it contains. Today I made it into a humongous sausage then sliced and fried the slices like fish patties. With a variety of spices the fish has improved in taste but the smell is here to stay, sigh. I guess I just have to burn a lot of scented candles every time I cook salmon. Serve with store bought or home made tartar sauce either with steamed rice or in a burger bun. In a food processor, process salmon until mushy, add all the ingredients except half and half, process for 1 minute until thoroughly mixed. While food processor is running, gradually add half and half. Transfer to a glass container, cover tightly with plastic wrap, put in the freezer until icy. Shape into a large sausage, wrap tightly, return to freezer. Freeze until firm, cut into ½-inch slices. Fry in a non-stick skillet until golden brown and firm to the touch. This salmon sausage has a hot dog consistency when cooked. I got these beauties yesterday, they are only available for a very short period during late winter. They are so sweet, from the bulb to the green shoots. Pre-heat oven to 500°F. Wash the onions well under running water. 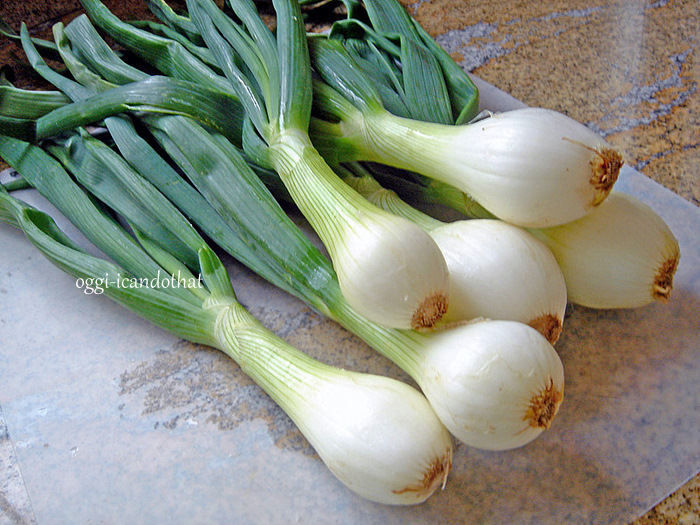 Cut green leaves 5 inches from bulb, slice in half crosswise. 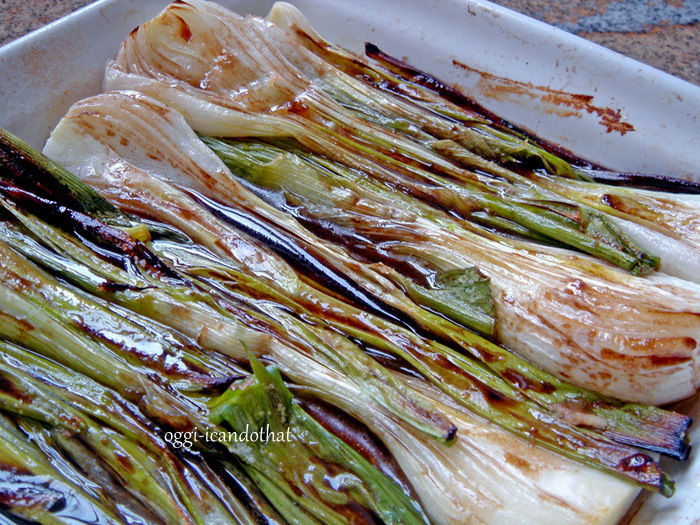 Mix with olive oil and sprinkle with salt, roast for 15 minutes. In a saute pan, melt the butter, add vinegar and sugar, cook for 2 minutes until it has thickened a little. Drizzle over roasted onions. Mix graham crackers, butter and sugar. Press firmly on a 10-inch pan with removable bottom. If you have mini pans, use 1 ½ T of the cracker mixture, refrigerate while preparing the filling. Beat cream cheese and sugar with electric beater until smooth. Add eggs one at a time, beating well after each addition. Blend together the cream and flour, beat into the cheese mixture, add the liqueur, mix well. Pour into the pan. Bake for 40 -50 minutes, or until almost set. Set aside until completely set. Refrigerate before serving. Serving suggestions: top with sweetened cream and pieces of hard caramel or pralines, or serve with caramel sauce. Last week I got a celery root to make into soup but made the misua and patola instead. The root has to be cooked before it gets bad and I did not want it to go to waste but it is getting warmer everyday and soup is no longer desirable. I julienned the celeriac and 3 carrots, then sauted them in 1 tablespoon butter until half cooked, about 2 minutes. Then I added 1 teaspoon each salt and sugar and 2 tablespoon water and steam cooked, covered, for 2 minutes. The dish does not need any other condiments and is surprisingly very flavorful. I sliced some previously roasted pork belly to go with the sauteed root vegetable. Marinate pork belly in sugar and salt up to 2 nights in the fridge. Roast in 375°F oven for 1 hour, skin side down. Brush all over with maple syrup, turn meat so that skin side is up, bake for another hour. Brush again with maple syrup and bake for another 30 minutes. It is recommended to let the roast pork cool overnight in the fridge because it is easier to remove the fat that will solidify. It will also be easier to slice when it has completely cooled. You can also use this pork belly to flavor assorted vegetables such as pinakbet or to flavor pancit. I have never made deviled eggs before and always avoided them at parties. Although I love eggs, these have never appealed to me because they look dry and blah. I have prepared the very versatile eggs in many different ways: fried, scrambled, omelettes, egg whites added to Chinese soups, soft and hard boiled to ramen soup, chopped for salad and sandwiches with olive spread, foo yung, and with red sauce, I could go on and on.:p. I was looking for a simple deviled eggs recipe and found one that is lemon flavored and topped with caviar. It's fortunate I have a jar of really cheap Icelandic black capelin caviar in the pantry that I was planning to use for onigiri and sushi. Use eggs that are at least 1 week old. The day before making deviled eggs, tape the box of eggs and lay it on its side to center the yolks. The next day, put eggs in a medium saucepan, add water to cover, let come to a boil. Immediately remove from heat, cover and set timer to 12 minutes. Drain and fill pan with cold water, changing 3 times. Leave the water and eggs in the pan, peel eggs under running water to avoid breakage and for ease of peeling. With a sharp knife, cut each egg in half lengthwise. Remove the yolks onto a bowl. Cover whites with plastic wrap and refrigerate. Mash egg yolks with a fork, cover with plastic wrap and refrigerate both for 30 minutes. Mix egg yolks with the rest of the ingredients, except lemon zest and caviar, until very smooth. Using a medium star tip, pipe yolk mixture into the egg white holes, extending a little bit over the hole. If serving immediately, spoon a little of the caviar on top using plastic utensil. Sprinkle with lemon zest. These can be covered and refrigerated a day before, adding caviar just before serving. My daughter asked me to cook meatless or fish dinners on Fridays because she is giving up a few things during Lent, and meat on Fridays is one of them. I am more than happy to feed everyone in my house fish and this is my chance to cook fish more often. Marinate fish in lemon juice, soy sauce and salt for no more than 10 minutes. In a large skillet heat oil on medium high. Roll fillets in cornstarch, fry until golden brown and crispy. Transfer to a serving dish. While fish is marinating, prepare the sofrito: Saute garlic and onion until cooked, about 3 minutes. Add lemon juice, soy sauce and salt, stir fry for 1 minute. Turn off the heat, add tomatoes, cilantro and ground pepper. Mix well and set aside. Spoon on top of fried fish fillets. Serve with steamed baby squash. Callos is one Spanish dish that I regularly make, it is so easy to prepare and so flavorful. I don't use tripe in my callos because it takes forever to cook and nobody in my house likes the smell of cooking tripe. I use a lot of chorizos instead. For a little variation I used green garbanzos (chickpeas). The colors of red peppers, tomatoes and the chorizos look so well with the green chickpeas. In a medium saucepan, heat 3 tablespoons olive oil and add the garlic and onion, cook for 2 minutes. Add the chorizos, fry for 2 minutes, then add the red bell pepper, saute for 2 minutes. Add the rest of the ingredients except chickpeas and let simmer for 15 minutes. Add the frozen garbanzos and simmer for 10 minutes, do not let boil rapidly or the chickpeas will break into mush. Drizzle the remaining olive oil before serving. You have to pre-boil separately tripe or pork hocks if you are using them. Then add with the meat as directed above. You would think it is strange to eat loofah, that thing you use for exfoliating while in the shower but it's true, patola is loofah in its green form before it's dried to make into loofah and it is edible and yummy. Most Asians I think eat this vegetable. When I was a child in Sta. Rosa, Laguna, I used to see them growing on my neighbor's fence which they gave away to anybody who asked, for free. Yesterday I went to the grocery for the sole purpose of getting celery root for soup but then I saw this really fresh young patola. I had to see if the grocery has very thin flour noodles we Filipinos call misua (Singaporeans call them meesua) and was so glad they have them. I looked for the recipe in my Filipino cookbooks and I was annoyed that not one among my 6 cookbooks has it. My Singaporean/Malaysian cookbook has almost the same recipe as the Pinoy's, they also use patola which they call ketola. I didn't put seafood and chicken, we had the soup with boiled eggs, just like the way my mother prepared it. For the soup, saute 2 chopped garlic and 1 sliced onion, add 5 C chicken broth and 1 T patis (fish extract) and bring to a boil, let boil for 2 minutes then add sliced patola, cook for 2 minutes, add 3 bundles noodles, cut in half, and cook for 2 minutes, do not overcook. Adjust seasoning with salt or fish extract. Top with sliced boiled eggs (I like my eggs boiled for only 5 minutes). Each time I go to the grocery there's always something that catches my attention, these blue potatoes surely did. They are a bit sweet and waxy and the blue color is so vivid. I got a pound and did not know what to do with them besides taking photos. I was thinking of a giant hash brown (or should I say blue), pancake, Spanish omelette, or individual latkes. I decided on a giant hash brown/pancake because it is simpler, it does not need eggs like latkes and Spanish potato omelette. It is so nice as a side dish with a little sour cream. Boil potatoes, whole and unpeeled, for 10 minutes. Let potatoes cool in the freezer for 15 minutes. Peel potatoes and coarsely grate. In a non-stick skillet, heat 1 tablespoon butter, saute onions until cooked, add to the grated potatoes with the salt, mix gently. Heat 1 tablespoon butter in the same skillet, add the potato mixture and press onto the skillet. Cover and cook on medium heat until a crust is formed, about 10-15 minutes. Invert on a platter, add the last tablespoon of butter to the skillet and ease back the potato pancake onto the skillet. Cook for 10 - 15 minutes until bottom has formed a crust. Slice into wedges and serve with sour cream. A sprinkling of crisp bacon bits with the sour cream is also very good. I found a package of dry bean soup mix in the pantry. I didn't buy it nor notice it being there before. 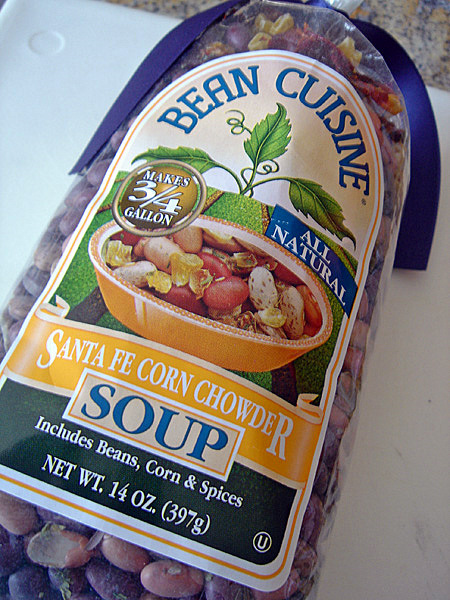 The package says it makes 3/4 gallon (12 cups), who makes almost a gallon of soup? I don't have a large family and we eat very little like birds (I can only have 1 cup in one sitting), we don't live in a ranch and therefore do not have ranch hands to feed but the mix has to be cooked all at once because the ingredients can't be halved (they're sort of layered inside the package). I cooked the soup anyway, following the directions on the package minus the chicken. I added more garlic and onions than the recipe asked for and used an ageing yellow pepper in place of red. The soup is very good, my only complaint is the spice package does not specify what spices are in it, which I believe are annatto powder, paprika, and a little cayenne. The ingredients on the package: pinto beans, green and red bell peppers, corn, garlic, onion, and cilantro. Heat all ingredients in a large pot and bring to a boil, turn the heat to medium-low, cover, and slow simmer for 3 hours. Add water if needed after 2 hours. Serve with corn tortilla chips or saltines and shredded cheese. This dry mix actually made 1¼ gallons (20 cups) of chowder/soup that we are drowning in right now. Lately I have been into cardamom. I just love it in desserts, tea and sweet baked items. It is also the flavor that defines chicken tandoori. I don't have a traditional tandoor oven, I usually grill the chicken. Today I baked them, I'm not in the mood to start the charcoal grill, although it is warmer today at almost 55°F. I bought some frozen naan at Trader Joe's and when I got home I found out they are made in India! They are sooo good, the real thing, soft, pillowy, crunchy, and chewy. I love it hot smothered with unsalted butter, yumm. Naan is the perfect pair to chicken tandoori. Hmm, maybe I should try to bake this naan recipe but it looks difficult. Mix all ingredients thoroughly, marinate overnight in the fridge. Pre-heat oven to 400°F. Arrange chicken on a single layer on a large baking pan and bake for 40 minutes or until chicken is slightly browned, turning once after 25 minutes. Serve with buttered hot naan and salad mix or sliced tomatoes and cucumbers.